There’s no shortage of ways to listen to music online these days, and Navegas is throwing its hat into the ring as a browser-based portal for accessing tunes from a variety of sources. As it’s made in Berlin, there’s little surprise that this is a good-looking site, oozing the Berlin style we’ve discussed previously. Launching with support for music stored locally on your computer, YouTube, SoundCloud and German streaming music service Aupeo (which is available globally, with dedicated licensing agreements in 43 countries), the plan is to add additional service to the left-hand sidebar. It’s easy to imagine, say, a Spotify unit for example, if that became possible. Once you’ve connected your accounts on the various you can browse your personal favourites saved in each one. 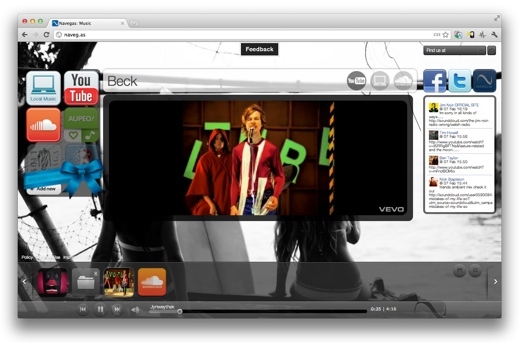 Alternatively, a search bar across the top allows you to search the whole of YouTube, SoundCloud or your local storage. From there, it’s a case of selecting songs, which are added to a playlist across the bottom of the screen and played in order. You can even connect your Twitter and Facebook accounts, and it will surface music shared by your friends to listen to within Navegas. It’s clear that Navegas is still a work-in-progress. There’s a lot more that it could be – with additional services, customisable wallpaper (for those who aren’t keen on the current ‘surfer girls’ image and more. However, as an easy way to find music and knock together a playlist to run in a browser tab as you work, it’s definitely worth a try.